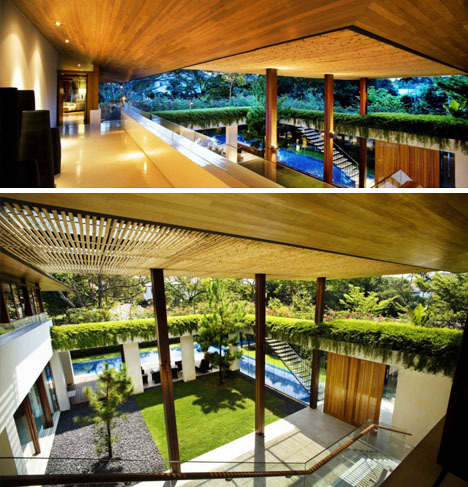 You should have no trouble seeing the forest through the trees while standing anywhere inside or outside this stunning home. 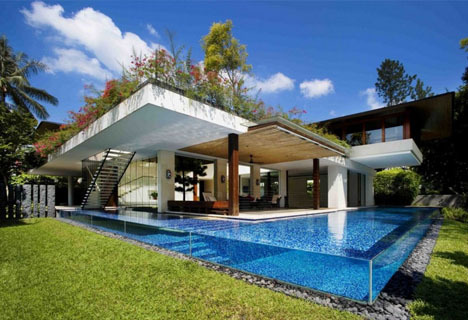 The residence is less of a house and more of an all-in-one exterior experience, flowing with green roofs, outdoor patios, expansive decks and a seamless clear-sided swimming pool (though one could wish it were deep enough to dive into from the rooftop above). 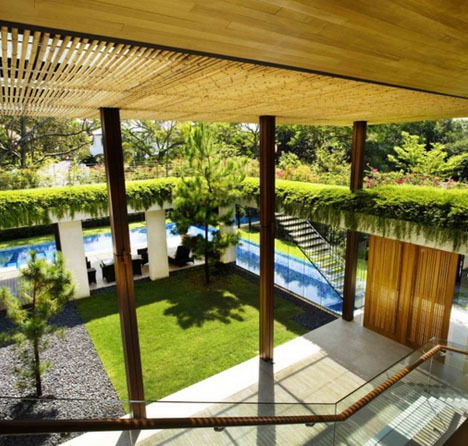 A central green courtyard brings life to even the innermost spaces of the dwelling, with plants overhanging from its walls above and trees sprouting up from the divided grass-or-gravel ground below. It might not be surprising but: these same designers have a history planning resorts and multi-family vacation destinations, experience which has clearly informed this single-family house. A series of rough-cut rectangular stone pillars serve to establish a border fence that is at once semi-transparent and secure, with slots that allow for limit views between each vertical post. 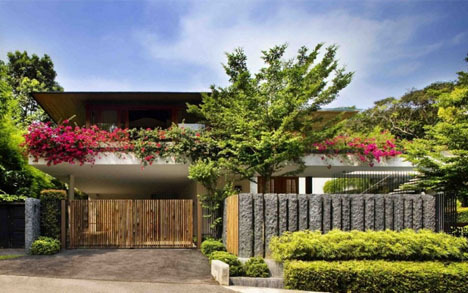 For the garage doors and entry gates, sticks of bamboo fill gaps between rocks. A second-floor terrace surrounds a cozy lofted set of lounge and bedroom spaces, likewise covered in colorful organic growth that doubles as a privacy divider and light filter. 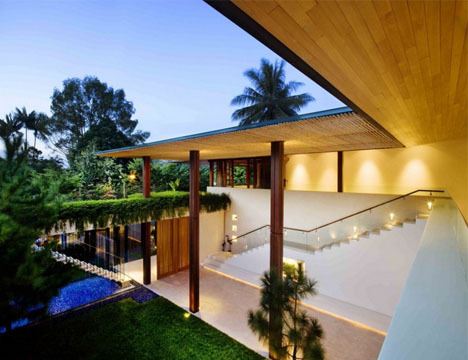 Semi-exterior zones are covered by spaced-out wooden slats that provide shade but offer no rain protection, while more-interior transitional areas in the plan have sealed solid-wood ceilings. 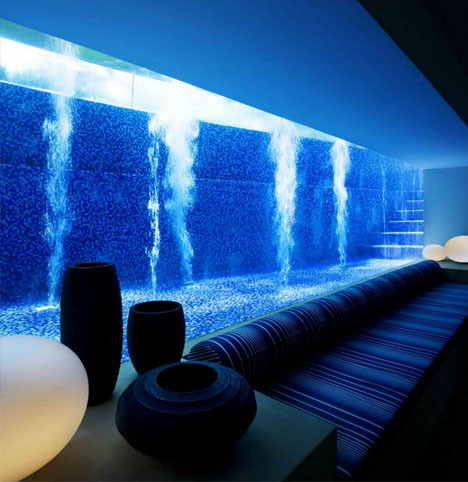 In the basement living room area, a built-in bench provides a cushioned viewed through wall-to-wall glass of the bubbling waters of the swimming pool outside, giving even this underground space a relevant connection to the outdoors. These images shot by Patrick Bingham Hall bring this design by Guz Architectsalive, but no number perfect perspective photos could do such a series of spaces justice. This is really a great post i love to know about garage doors.these pics are great .